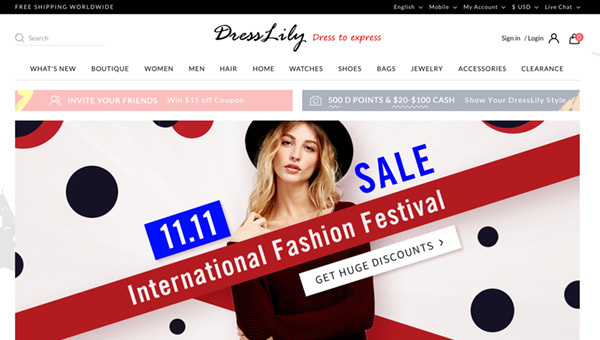 DressLily – is a Chinese online shop of women's and men's clothing, shoes, accessories, watches, jewelry and handbags. Although it presents itself as a fashion store you can find a huge selection of wigs there both for cosplay costumes and direct use, in addition this service also offers home textiles, kitchenware, interesting and unusual interior items. Their motto is to provide the customer with stunning and quality products at reasonable prices. We would find difficulty to quarrel with this statement, since prices are really not high. In addition, there are always discounts and coupons. It is also worth emphasizing constant replenishment of goods and keeping up on the latest fashion trends, in this online shop you will find high-quality fashion products, which you will want to dress immediately after delivery. You will always be the focus of attention even for little money. There is a very interesting bonus program on the website, customers can collect the so-called D Points, which can then be cashed, 500 D Points = $10. You can earn points in different ways: signing in, confirmation of email, a purchase made, a feedback, downloaded videos or photos. You can pay for purchase in several ways: PayPal, credit cards, gift cards DressLily or the so-called DressLily Wallet. The site works with many delivery services, including DHL, UPS, FedEx, IB, and EMS, and ensures for three types of delivery: express (3-7 business days), standard (6-8 business days) and regular direct (5-25 business day), which is free.